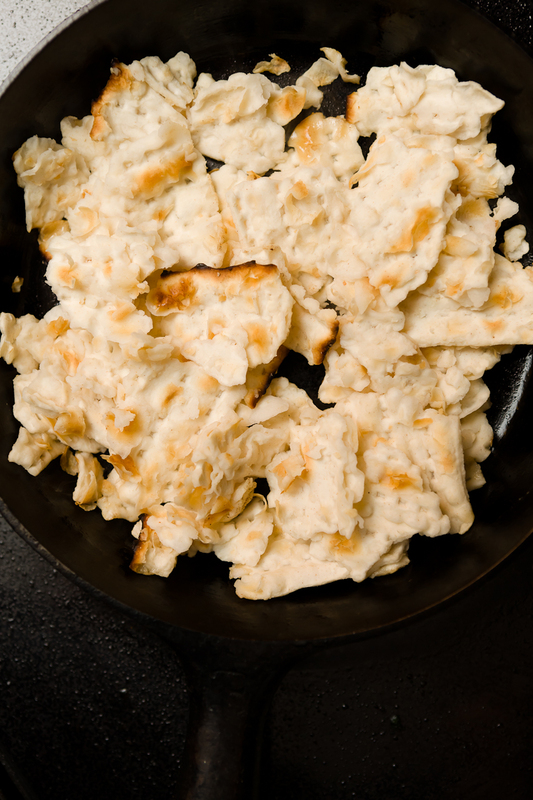 Matzah brei, or fried matzah, is a classic Jewish breakfast made by frying eggs and matzah. It’s most commonly eaten during Passover, but many eat it year-round. Everyone thinks that their mom’s recipe is the best and I’m no exception. Matzah is a flat cracker-like bread traditionally eaten during the Jewish holiday of Passover. During Passover, many Jews eat only unleavened bread to remind them of the time that they were slaves in Egypt and had to leave so quickly that they couldn’t let the bread rise. Matzah can be spelled in a variety of ways as it’s the transliteration of the Hebrew word מצה. You can spell it matzah, matzoh, or matzo; all refer to the same cracker-like bread. Brei (בריי) means fried in Yiddish. So, matzah brei is literally fried matzah. But, plain fried matzah is not what anyone would think of as matzah brie. Matzah brei is fried matzah plus eggs. Every Jewish family has their own take on how to make matzah brei. In this post, I share the matzah brei recipe I’ve eaten every Passover since I could eat solid food. Is Matzah Brei Kosher for Passover? Believe it or not, not all matzah is technically Kosher for Passover. It needs to be prepared in a special way and receive a certification to qualify as Kosher for Passover. Check the box for the words “Kosher for Passover” before purchasing. Beyond that, you’ll want to check the guidelines of the home you are making the matzah brei in. Some people swap out all of their cookware and dishes for Passover and won’t use any ingredients without “Kosher for Passover” markings (see the orange juice bottle above for an example). If that’s the case, you’ll want to be sure to follow their household rules. Others, like myself, will eat anything as long it isn’t leavened (like yeast bread or cakes with baking soda and baking powder). As I stated above, the matzah brei my mama makes is the not the same recipe that every Jewish mother makes – each family has their own twist and each family knows that their way is the “right” way. Frittata-style (sometimes called omelet-style): In this method, there is a higher ratio of matzah to egg. 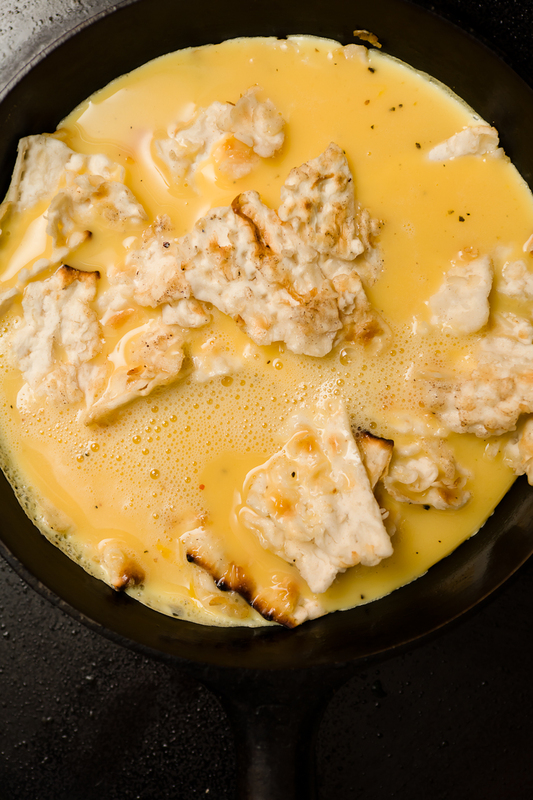 The matzah and eggs are mixed prior to cooking, the two cook together into one solid mass, and the dish is served out onto the plate like a frittata – a frittata without any veggies or meat. Who needs anything else when you can have starch? Does any other culture mix a cracker with eggs and call it breakfast? Cake-style: In this case, a large skillet is used and a thick layer of matzah and egg mixture is poured into the pan. Rather than producing a single-serving frittata, this method yields a matzah brie “cake” that is served in slices. 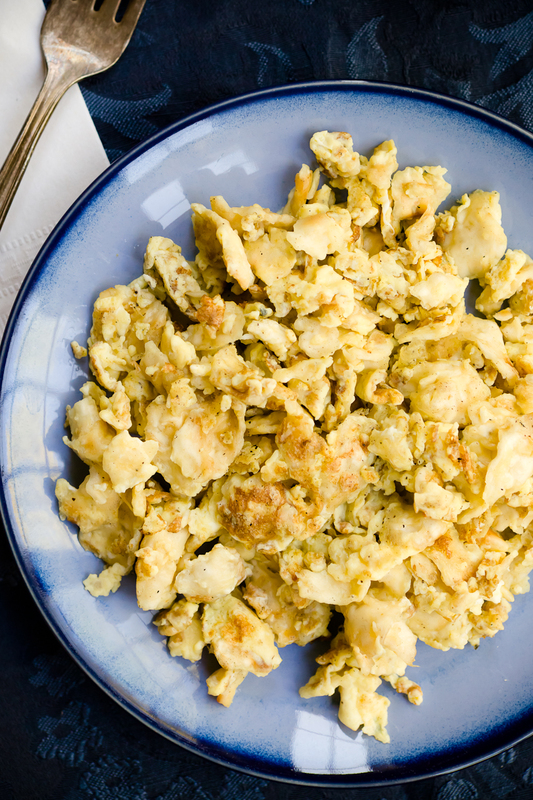 Scrambled-style: As the name implies, this style is basically scrambled eggs fried up with matzah. This is my mom’s style. How Soft Should the Matzah Be in Matzah Brei? The first step in making matzah brei is to soften the matzah. You put broken up pieces of matzah in a colander and run water over them until they are no longer crispy. Regardless of preparation style, different families prefer different levels of matzah softness. I like my matzah hard enough that it doesn’t fall apart, but soft enough so that I can easily cut it with a fork. Jonathan thinks this a blasphemy and that the matzah should be almost mushy (ironic since he prefers matzah balls that are hard as rocks – an entirely different debate). Another debate in the matzah brei world is whether to serve sweet or savory matzah brei. Adding savory spices like garlic powder, onion powder, and other herbs. Mixing in lox (smoked salmon). Adding vanilla and cinnamon. My father first introduced me to this method when I was in my 20s. He had never been the one to make my matzah brei as kid so I had no idea that he was holding out on this great twist. Topping matzah brei with maple syrup or jam. A matzah apple cake like this one from Noble Pig. I can’t let you leave without telling you about my flourless chocolate cupcakes, my ginger coconut macaroons, and my chocolate mousse pie with a coconut macaroon crust. They are Passover musts every year! Every Jewish family has their own take on how to make matzah brei - the classic Passover breakfast of eggs mixed with fried matzah. This the recipe from my mom. Break matzah into small pieces. The pieces definitely do not need to be uniform. Place broken matzah pieces into a colander and run water over them until they are soft but not soggy. When the skillet is hot (you'll know because water dropped into it will sizzle), add butter and swirl to coat the pan. Add matzah to the skillet and fry until the edges just begin to brown (this should only take a few minutes). In a small bowl, beat eggs, milk, salt, and pepper until the mixture turns a pale yellow. 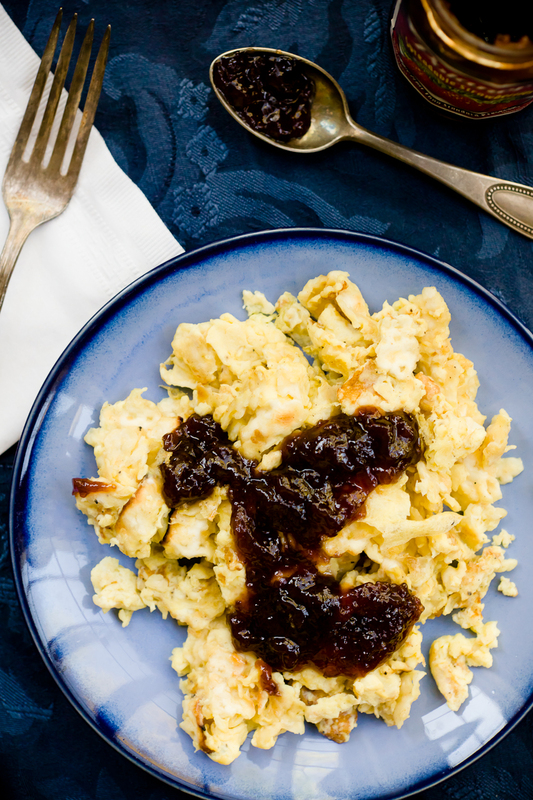 Add eggs to the matzoh and scramble until cooked. Turn out to a plate, top with syrup or jam, and enjoy. To make a savory version of this dish, mix in lox and/or savory spices like garlic and onion powder to the eggs.